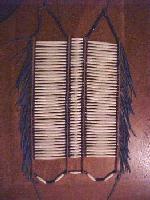 I was taught how to make these from a Lakota friend. He liked the neatness of my work, but he told me the breastplate would not make it past 2 dances. He taught me how to make these in the "old way". 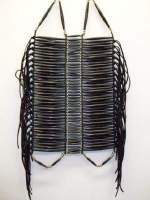 As he was explaining how breastplates were made, he would also tell me why things were done in that way, making me understand the purpose of the breastplate. I made a promise to him, to always make these breastplates with this understanding. As I make these breastplates I will always remember why they exist. Aho! but can be added for additional cost. I have always wanted to make one in these colors. I am very pleased with the color combinations. These are great for the Scouts and School Mascots. 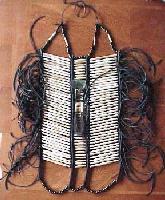 They are lighter weight than the bone breastplates and are worn more easier. Available in many colors and styles! These are awesome looking. These colors look really natural. 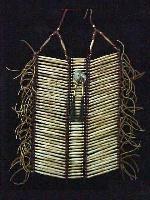 All images are sole property of Native American Expressions. 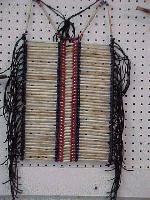 Any use or reproduction of these images withoutwritten permission of Native American Expressions is prohibited. We will scalp YOU!!! !